Successfully Added Slider Keyboard Case for iPhone 4/4S - Bluetooth, QWERTY Lay Out to your Shopping Cart. 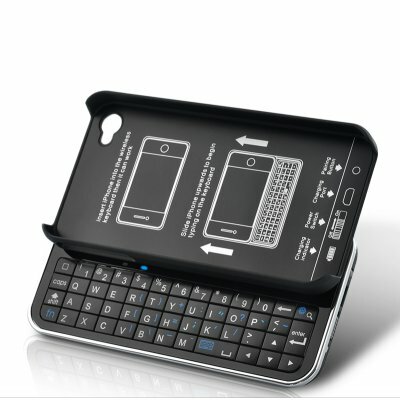 Slider Keyboard Case that has been specifically design for iPhone 4 or 4S has Bluetooth connectivity as well as a cool QWERTY Lay Out for simple data entry. The sleek, low-profile Bluetooth keyboard case makes sure that your iPhone 4/4S still looks just as attractive as before, while offering you a QWERTY keyboard lay out for easy typing. It also provides a secure and comfortable grip as well as excellent four-corner protection in-case of a fall. It’s like having all the benefits of a protective phone case and keyboard combined into one but with none of the hassles. The full QWERTY keyboard makes it much faster to type long emails or instant messages, and the buttons are large enough so that you’ll hit the right key every time. This case uses the iPhone's Bluetooth connectivity and thus the entire set up is completely wireless. Just slide your iPhone into the case, turn ON the wireless keyboard, sync your iPhone to the Bluetooth keyboard and you are set. Form-fitting shell designed to snap on securely to perfectly fit your iPhone 4/4S. The cut-out design allows for touch screen to be easily accessed therefore it is still the same tactile feel as using the iPhone 4/4S without the case. Also it has specialized keys for iPhone’s Home button and Search button plus it also providea quick access to all of iPhone’s controls, features, camera, and ports. If you are looking for a stylish iPhone case with an easy to use wireless keyboard- then it doesn’t get better than this Bluetooth slider QWERTY keyboard case. Take advantage of our factory direct pricing and order the case in bulk to generate some nice profit on a sure-shot best seller. Brought to you by your source for the latest high tech gadgets, Chinavasion. Charge Time of 12 Hours Recommended Before First Use. Hi, I already ordered this item. I'm impressed with Chinavasion processing time and delivery. I got my item within 2-3 days only. Amazing! Regarding the product, I could see the quality of the packaging and the item itself.